Nico Rosberg has taken an easy pole position at the Belgian Grand Prix after Lewis Hamilton counted himself out of qualifying with grid penalties. Rosberg was pushed hard by local favourite and half-Belgian Max Verstappen, who will start on the front row for the first time in his F1 career after lapping within 0.15 seconds of the leader. The Mercedes driver’s first attempt at provisional pole ultimately delivered the goods, though there was concern in the Mercedes garage that the car couldn’t extract the maximum from its delicate supersoft tyres. The German, 19 points down in the world championship, will have no such concern in the race, which he will be able to start on the soft tyres on which he set his fastest Q2 time. “Happy to be on pole — the only thing is it’s going to be a very challenging race because the tyres are extremely difficult out there,” said Rosberg. “There are going to be a whole of things going on, so it definitely will not be an easy one. “We had a difficult weekend up to now. This morning we were seriously off the pace on one lap. Red Bull Racing’s Verstappen also set his fastest time on his first attempt, and the Dutchman said he could have milked more from his car had the track conditions not escalated beyond 40 degrees by the end of the session. “You can always do a better job, but then I think Nico could’ve done a better lap,” he said. “In the end to be so close to [Mercedes] on that track, we can be very pleased with that. Though his legions of fans were happy after qualifying, the teenager will be forced to start the Belgian Grand Prix on the supersoft tyres, which are likely to last fewer than five laps should conditions remain unusually warm at Spa. Kimi Räikkönen, the most successful current driver around the Circuit de Spa-Francorchamps, qualified just 0.017 seconds behind Verstappen in his Ferrari. It served as a helpful boost to Ferrari, which ended the first half of the season on a low note and appeared to be on the back foot throughout free practice this weekend. Räikkönen added that he felt there was more to come from his car, pointing out that his final sector in Q3 was slower than the same sector in Q2 despite using faster tyres in the latter session. Sebastian Vettel qualified 0.2 seconds behind his Ferrari teammate and 0.1 seconds ahead of Daniel Ricciardo, who was 0.3 seconds slower than his teammate and almost half a second off pole. Sergio Perez led Nico Hülkenberg for Force India in sixth and seventh. Both Williams cars had power unit problems in qualifying, leaving Valtteri Bottas eighth and Felipe Massa ninth, with Jenson Button’s McLaren slotting between the two. Every car in the top five other than Max Verstappen will start on the soft tyre, enabling them to avoid the supersoft tyre completely should conditions remain unfavourable for the red-marked compound. But though the weather was initially forecast to be similarly warm day on Sunday, rain is now on the radar, potentially negating any strategic advantage. The second qualifying segment was to be defined by top-10 aspirants attempting to qualify on the soft rather than the faster supersoft tyres. 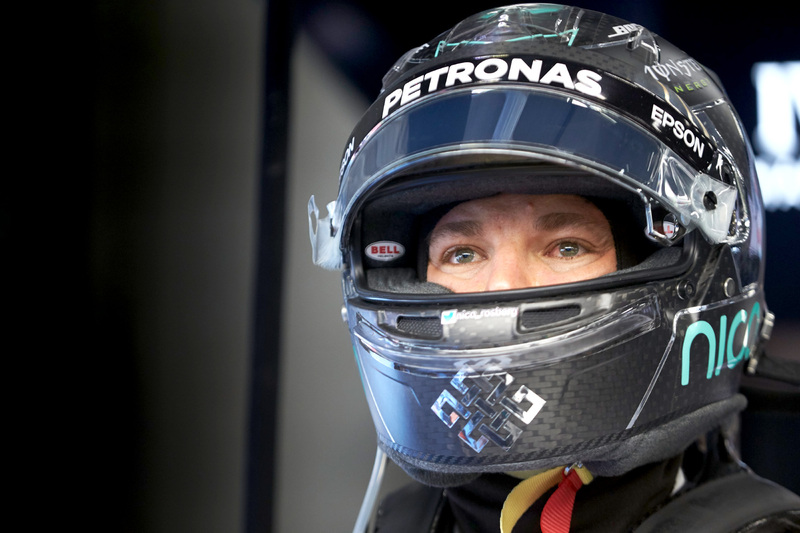 Rosberg had little difficulty setting the fastest time on the middle-compound soft rubber with a 0.1-second advantage from the supersoft-shod Verstappen in his RB12. Verstappen’s teammate Ricciardo risked his passage to Q3 with a lap on the softs, and after the first runs he sat a precarious ninth-fastest — though confidently chose not to set a second lap. Ferrari, too, wanted gambled on the strategic softs, but it had less faith in its pace. After Räikkönen and Vettel set the fifth and eighth-quickest times, both were sent out on supersoft tyres as the midfield set their final flying laps. But of those on renewed attempts only Button could put his car into the top 10, and the Scuderia’s pit wall told Vettel and Räikkönen to abort their laps, allowing them to start Sunday’s race on their original soft tyres. Romain Grosjean was knocked out by Button’s final Q2 lap and will start from eleventh ahead of Kevin Magnussen, who impressed for Renault. Esteban Gutierrez qualified thirteenth, but the Mexican will serve a five-place grid penalty for obstructive driving during Saturday morning free practice. Jolyon Palmer set his most competitive F1 qualifying result with the fourteenth-fastest time, keeping at bay Toro Rosso’s Carlos Sainz and Manor’s Pascal Wehrlein. Qualifying began in unusually warm 31-degree conditions at Circuit de Spa-Francorchamps for Formula One’s resumption after its midseason break. Intrigue surrounded Lewis Hamilton, whose Mercedes car carried a 55-place grid penalty for three power unit changes that took him beyond his maximum allocation of parts. Due to the effect of the unpredictably warm conditions on Pirelli’s selection of medium, soft, and supersoft tyres, Mercedes and Hamilton chose to set only one lap within 107 per cent of the fastest time in Q1, preserving tyres in the process. Hamilton’s effective exclusion from proceedings was coupled with Fernando Alonso’s forced withdrawal from the session when his McLaren, complete with an upgraded Honda power unit, stopped on track. Alonso’s car failed before the Spaniard could set a time, meaning he will start behind Hamilton at the back of the grid after the stewards grant him dispensation to enter the race. With two Q2 contenders already knocked out only four other drivers would have to miss out on progression to the top 16, and the battle came down to a flurry of laps after the chequered flag. The 20 remaining drivers were separated by just 1.3 seconds, and Sauber’s Felipe Nasr was just one-tenth off the pace in P17. F1 debutant Esteban Ocon put his Manor a further tenth of a second off the pace, fending off Toro Rosso’s Daniil Kvyat and the second Sauber, helmed by Marcus Ericsson, in P20.